A column of three Panzerfeldhaubitze (Armored Field Howitzer) 18M auf Geschutzwagen (Self-Propelled Artillery) III/IV (Sf) "Hummel" (Bumble Bee) SdKfz 165 cross an open plain, probably during the Battle of Kursk. You can see most of the Hummel's crew in this photo; the open top exposed them to small arms and aircraft fire. These are early model Hummels mounting the 150mm (5.9 inch) sFH 18 L/30 howitzer with a range of 14,490 yards (13.25 kilometers) for indirect fire support. A battery of six Hummels, with an accompanying Munitionstrager (ammunition carrier) Hummel, were attached to each panzer division for Operation Zitadelle (Citadel) in July 1943; over 100 were available for the campaign. While Kursk is famous as the largest tank battle in history, it was also the scene of heavy concentrations of artillery. The Soviets barraged the Germans with fire from 3,000 guns and mortars on July 4, using half of their available ammunition and seriously reducing the German volume of fire. 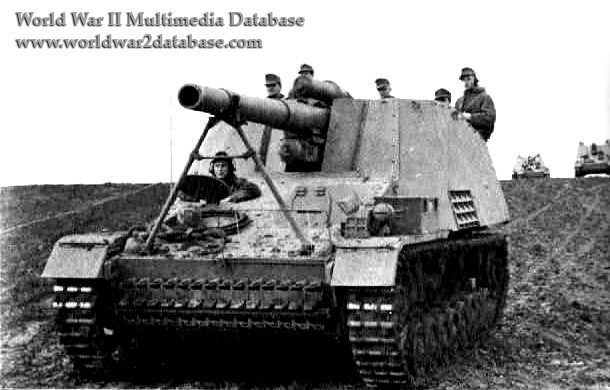 Hummels were used on both fronts for the rest of the war. Date and location estimated.